To most people, mice are unwelcome pests that spend most of their time scheming to get into basements, barns, pantries, and attics. To us, and many other scientists, mice are a priceless resource. Mice are the premier mammalian model for human disease. Many of the traits that make them pests also make them great for research. They readily live in captivity, they breed quickly with large litters, and they are tolerant of human contact. We owe much of what we know about the function of genes to research in mice and other genetic model species. Mice are also an excellent model for evolutionary genetics. The house mouse that we think of is actually made up of three (main) subspecies that diverged ~350-500 KYA, show some evidence of barriers to successful reproduction, and hybridize in nature. In addition, the three subspecies have very different demographic histories, which makes them a useful comparative system for population genetics. On top of all of that, house mice have recently spread nearly worldwide into a wide variety of habitats, making them a great system for thinking about adaptation and the impact of invasive species. Despite arriving in the Americas relatively recently with European settlers, the house mouse has expanded into a wide variety of climates and habitats in the Americas, ranging from Tierra del Fuego to Alaska. Research to date suggests that shifts in body size, behavior, and metabolism have been important in their successful colonization of the East Coast of North America and many candidate genes contributing to adaptation have been uncovered. Future work will expand on these findings, working with populations in South America and using new inbred strains of mice from extreme climates to connect adaptive traits to specific genes. This research will help us understand how species adapt to their environment. 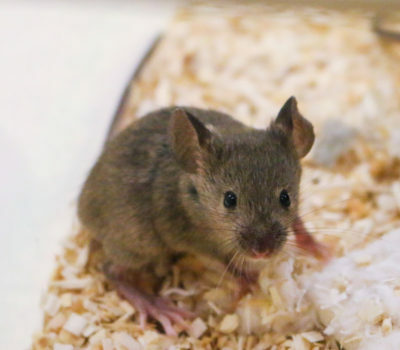 Many of the genes and traits that have been implicated in mice as contributing to environmental adaptation, are related to traits of interest in humans, like obesity and diabetes. This work is done in collaboration with Michael Nachman at the University of California, Berkeley. Understanding the outcome of interacting evolutionary forces, like selection and drift, is a fundamental goal of population genetics. While it may seem like all mice have infinite population sizes, the three main subspecies have very different demographic histories. As a result, their effective populations sizes are quite different (although definitely still large than the effective population size of humans!). While estimates of effective population size (Ne) are large for M. m. castaneus (200,000-733,000), estimates are much smaller for M. m. domesticus (58,000-200,000) and M. m. musculus (25,000-120,000). One prediction of population genetics theory is that selection should be more effective in populations with larger effective population sizes. However, other factors are also important and empirical data are needed to test such predictions. Using SNPs genotyped across ~30 wild caught individuals of three subspecies of house mice and the McDonald-Kreitman framework, I found the most evidence of positive selection in the species with the largest effective population size. This area of research has a long history and increasingly powerful datasets and refined methods continue to fuel this research. House mice are well-suited for studying speciation. There are three main subspecies of house mice which diverged in the last ~350,000-500,000 years—a good timeframe for investigating the genetic basis of speciation. There is evidence of barriers to successful breeding among subspecies, but inter-breeding is still possible. That means that mice are relatively early in the process of speciation and that we can still use crosses between the subspecies to learn about the genetic basis of reproductive barriers. In addition, there are known (and, in some cases, well-studied) hybrid zones in the wild. As a result, there is a rich literature on speciation in mice. In fact, the only gene known to contribute to speciation in mammals, PRDM9, was discovered in mice. Recently, genomic tools have made new approaches possible. Working at the University of Arizona and UC Berkeley, I sequenced the testes transcriptome (genomic regions that code for proteins) of wild-derived inbred lines from each subspecies of house mouse identifying >30,000 SNPs in >4,500 genes. I used these data to identify specific candidate regions for reproductive isolation and to investigate the relationship between effective population size and genetic differentiation. I found that levels of sequence differentiation were higher and that there were more regions of high differentiation between the two subspecies with the smallest effective population size, Ne. In addition, more genes were differentially expressed between those two species. These results are consistent with laboratory crosses that show the greatest reproductive isolation between those subspecies and with demographic predictions. These data addressed fundamental questions about the process of speciation and identified specific candidate regions for future research.